After submission 'draft research proposal', I have been considering about methodology. First, I intended to use qualitative approach because I thought the study about tourists' motivation may be required in dept interview to find out each tourist's motivation and the reason to visit specific sites. Also, many dark tourism studies in UK seems to use qualitative approach - at least journal articles that I've studied-, so I believed that qualitative approach was suitable for dark tourism studies. However, I realised that I was wrong and it was so narrow point of view. While I studied for my special interest tourism and marketing projects, I read many academic articles which use quantitative methodology. And I started thinking to use quantitative approach to research not only tourists' motivation but also create typologies of so called dark tourists with measurable data to prison museums and cemeteries where Easter rising occurred in Dublin, Ireland. But I was unsure which approaches might fit for my research questions. However, after meeting my supervisor, he gave me a simple and clear answer. He also recommended to use quantitative method for researching tourists' motivation for the view of dark tourism. It was clear for me to understand how different methods are possibly able to use depend on the direction of research and what I intend to find out the result. Therefore, I am going to use quantitative research method for my dissertation topic rather than qualitative method. I need to study more about tourists' motivation and behaviour for the view of dark tourism to have distinctive research because I realised that many tourists' motivation of dark tourism have been researched among researchers. 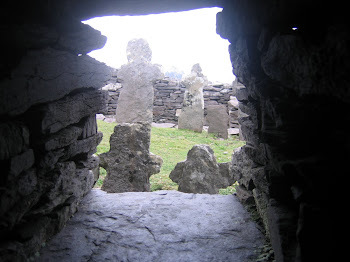 As my research question is: Why particular groups of tourists are fascinated with sites associated with death? I will research tourists behaviour to sites associated with death: Arbourhill cemetery and Kilmainham Gaol in Dublin. ( I will explain in detail about 'Easter rising' in Dublin in the next post). I might create tourists' profiles of those sites with measurable quantitative data. I may focus on psychographic and behaviouristic groups rather than demographic group. However, There is a dilemma. Because the sites where the event of Easter rising occured are directly linked to Irish history. Therefore, the analysis of demographical profile may be important to examine who visit these places and why? Before set the hypothesis, I must make clear the research objectives that I intend to find out the result. I will do 'positivism' for research philosophy - 'deductive'(quantitative) approach - 'survey' strategies - 'questionnaires' for the data collection method. Nevertheless the decision of research method is vital, I need to make more clear of the research question (again..) and objectives to develop hypothesis. I see you're just at the early stage of your thesis writing. How'd you come up with your thesis topic ideas? I'm not too familiar with dark tourism studies, and I'm really curious. I realised that many tourists' motivation of dark tourism have been researched among researchers.